The baby's room is decorated with a woodland theme (see this post), and we decided to use the same theme for the shower. 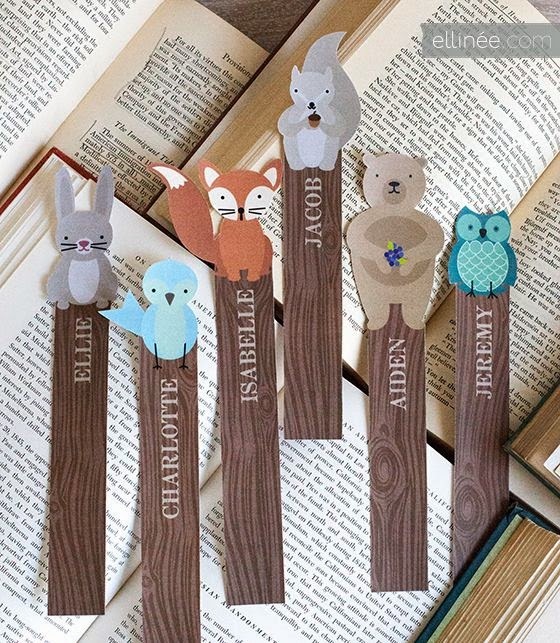 I was in charge of invites, and I picked up some funky owl note cards at Target to turn into invitations, but then I found these baby fox invitations from Classicology on Etsy. I checked with Jen and Mom and they agreed that the foxes were in and the owls were out. Jen and I pinned a lot of woodland party and baby shower ideas, and in the end, some things we used and some we didn't. There are so many over-the-top party designs to drool over online, but when it comes down to it, you can only do so much. People will appreciate any effort you make, and no one will ever know about the dozen other things you pinned and never made (like the burlap bunting that I even bought supplies for...). I cut the tops off of these bookmarks and glued them to skewers for little tuck-ins for the flower arrangements. For the favors, I made little acorns with half mini Nutter-Butter cookies, chocolate Kisses, butterscotch chips, and chocolate frosting. More free printables decorated each treat bag. Jen decorated the food table with a wide burlap runner, a large vase, and dried flowers. The vase and flowers were already on her table, and to enhance the woodland feel, she wandered to the woods nearby and clipped some twigs to tuck into the arrangement along with the little bookmark skewer guys. We were excited to discover that the vase fit perfectly in a woodsy drawstring toy bag I made for Jen's daughter for Christmas a while back. Our mom and her friend assembled an awesome diaper cake (spiraling the diapers instead of rolling each one makes it super classy). We wrapped each layer with ribbon and tucked in a variety of woodland animal ornaments and stuffed critters. Mommy-to-be Emily crocheted the owl at the top. I brought some of the quilt blocks that I was making for a quilt for the baby's room and we hung them across the doorway as a banner.